A photo of the pills seized during a search of a home in Loyalist. Photo by OPP. A 16-year-old Loyalist Township youth was arrested last Tuesday in connection to the ongoing investigation of prescription drugs being trafficked inside the halls of Napanee District Secondary School. Charges were laid after officers with the OPP Community Street Crime Unit (CSCU) executed a Controlled Drugs and Substances Act search warrant at a residence in Loyalist Township. The youth was charged with possession of a controlled substance and possession of a prohibited weapon, which OPP say was a knife. The search warrant was conducted following an investigation into incidents reported to police where it was alleged that prescription medication was being trafficked at NDSS. 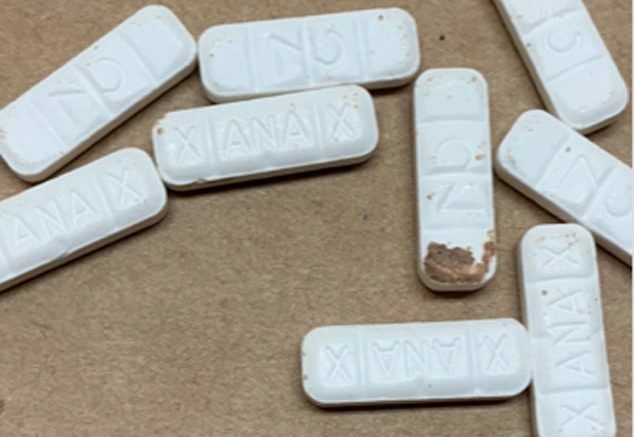 The Limestone District School Board had earlier confirmed there had been instances of “students having serious reactions/and of overdosing (non-fatal) on counterfeit Xanax” at NDSS. The male youth faces an additional charge of possession of a controlled substance for the purpose of trafficking in relation to an incident that occurred at the high school on Oct. 19. The accused was released on a promise to appear and undertaking and is scheduled to appear in the Ontario Court of Justice (Youth Court) in Napanee. Meanwhile students and guardians are encouraged to drop off any illegal drugs at a “safe drop-off zone”, located at Wallace’s PharmaChoice Drug Store in Napanee. OPP warn that any illegally obtained prescription drugs could contain deadly fentanyl. -On Oct. 31 at 12:42 p.m. officers with the Loyalist detachment of the OPP responded to a report of a male yelling and acting strangely outside of his vehicle at a gas station in Odessa. Officers arrived and the male was given the standard field sobriety test demand to perform mandatory physical coordination tests. The male driver performed poorly which resulted in him being arrested for care or control of a motor vehicle while impaired by drug. A further demand was given for a drug recognition evaluation and the male was transported to Loyalist detachment for evaluation. He was determined to be impaired by drug and a sample of bodily fluid was seized for analysis to be sent to the Centre of Forensic Sciences to determine the exact drug(s) that the driver was impaired by. The 42 year-old male from Kingston faces charges of care or control of a motor vehicle while impaired by drugs. Officers also charged the accused under the Cannabis Act with possessing more the 30 grams of cannabis in a public place after seizing 734 grams of dried cannabis from the vehicle. He’s scheduled to appear in Napanee court on Nov. 20.